Just as Poles were settling in Batavia, another Polonia was emerging seven miles northwest of the city in Oakfield. Spurred by the promise of employment at the United States Gypsum Company, Poles flocked to the small Genesee County town in the early nineteen-teens. Once there, they infused themselves into society which had both short-term and long-lasting effects. When US Gypsum opened the mines and began planning a new plant in Oakfield, Poles both in American and in Poland caught wind of the job opportunities that were being offered. Soon Peter Matla, Andrew G. Domagala, Joseph I. Balonek, Frank M. Yanick, and many more were working for the company on the town’s west side. Near the plant and mine, US Gypsum provided housing and the area around the intersection of Hutton Road and Maple Avenue became the hub of this new Polonia. While many worked in the mines and factories, other Poles took to the fields. After arriving in Western New York from Poland, John Gontko purchased and maintained a farm east of town. 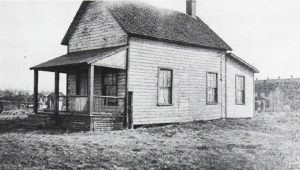 As the population swelled, the need for a Polish social center became apparent and by 1915, a house on Hutton Road was converted into the Polish Library a venture that was sponsored by the Polish National Alliance. More than a repository of books, the library became the cultural center of Polish Oakfield. It became a meeting place for the Polish National Alliance branch Peter Matla helped to form, a drill location for the members of the Polish Falcons who didn’t want to travel to Batavia, and a place where community-wide events could be hosted. The May 3rd Constitution parades would start at the library and end at St. Cecilia’s Roman Catholic Church, ceremonial flag raisings would be held at the library, and bands would be invited to perform while speakers from far and wide would address the Poles of Oakfield at the library. After the Second World War an effort to build a new Polish National Alliance building was undertaken. The first building was razed but its replacement never came and the address remained vacant. By 1918, it became clear to the Roman Catholic Diocese of Buffalo that something would have to be done to meet the religious needs of the Poles in Oakfield. In 1902, St. Cecilia’s Mission was started in Oakfield to minister to the Irish Catholics in the area. By 1906, it became a territorial parish focusing on the Italian community built around the region’s canning industry. Finally in 1919, the diocese came up with a solution, St. Cecilia’s would remain a territorial parish, but be treated like an ethnic parish for the Poles and Italians. To oversee this experiment they transferred the multilingual priest, Father Ladislaus Bartkowski. 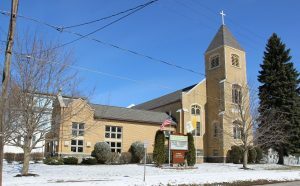 Before being assigned to St. Cecilia’s, Father Bartkowski had already served as a pastor of Holy Trinity in Niagara Falls, Holy Cross in Salamanca, Transfiguration in Olean, and as an assistant at a handful of other Polish parishes. His mastery of both Italian and Polish allowed him to hold a special Mass dedicated to St. Rosalia one week, and officiate a traditional Polish wedding the next, endearing him to both communities. In 1929, Father Ladislaus also oversaw the building of a new St. Cecilia’s church, a feat covered in the national magazine Poland. Following the death of Rev. 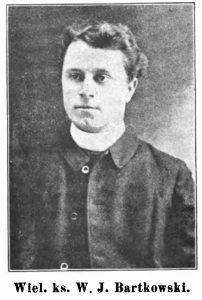 Bartkowski in 1930, a number of other Polish priests would oversee St. Cecilia’s. Father Francis Klopp, a former assistant at Transfiguration church in Buffalo and member of the Marconi Society would often address the wider Genesee County community about the lives of Poles and Poland. Father Alexander Jankowski would see the parish through the Second World War while Father John M. Blacho a one-time assistant at Queen of Peace would take over after him. Reverend Bernard Sierakowski would serve a short stint at the parish while Father August Parwulski, a priest who ministered across two dioceses, from St. Casimir’s in Elmira to St. Barbara’s in Lackawanna, would stay at St. Cecilia’s for almost 20 years. Even in the new millennium Poles have served at the former St. Cecilia’s, renamed St. Padre Pio Parish, with the most prominent being Father Thaddeus Bocianowski, former rector at St. Stanislaus Bishop and Martyr parish in Buffalo. Although the once strong vein of Polonia that ran through Oakfield has diminished, remnants of it can still be found in the parish church and by the names in the phonebook. "Buffalo Priest In Oakfield Pastorate." Times-Union [Rochester] 21 Jan. 1930, Evening ed. : 33. Print. "Deaths in Western New York Area." Rochester Democrat and Chronicle [Rochester, NY] 10 Oct. 1951. Print. "Deaths Reported in Vicinity." Rochester Democrat and Chronicle [Rochester, NY] 10 Jan. 1957: 4. Print. "Deaths Reported in Western NY." Rochester Democrat and Chronicle [Rochester, NY] 7 May 1959: 33. Print. "Deaths Reported in Western NY." Rochester Democrat and Chronicle [Rochester, NY] 28 Oct. 1967: 6-C. Print. "First Service Today in New Oakfield Church." Rochester Democrat and Chronicle [Rochester, NY] 17 Mar. 1929: n. pag. Print. "Kiwanis Club." The Times [Batavia, NY] 30 June 1932: 7. Print. "Largest Gypsum Plant in the World." Rock Products and Building Materials 22 May 1914: 25. Print. "Late Local News Items." The Times [Batavia, NY] 23 Jan. 1930: 5. Print. "Lay Cornerstone of New Catholic Church." Rochester Democrat and Chronicle [Rochester, NY] 22 Oct. 1928: n. pag. Print. "Mission at Oakfield." The Times [Batavia, NY] 18 Apr. 1925: 2. Print. "New Polish Church." Poland Vol. 10 1929: 436. Print. "New St. Mary's Pastor Is Named." Niagara Falls Gazette [Niagara Falls, NY] 4 Dec. 1937: 3. Print. "Oakfield Italians Are To Celebrate." The Daily News [Batavia, NY] 4 Sept. 1919: 9. Print. "Oakfield News." The Daily News [Batavia, NY] 26 July 1919: 5. Print. "Oakfield Picnic at Griffin's Run." The Daily News [Batavia, NY] 17 July 1917: 7. Print. "Oakfield Seniors Guests of Juniors." The Daily News [Batavia, NY] 7 June 1915: 3. Print. "Pastoral Assignments Made by Bishop O'Hara." Buffalo Courier-Express [Buffalo, NY] 29 June 1945: 1. Print. "Pauline Order to Take over St. Stan." Ampoleagle.com. Am-Pol Eagle Newspaper, 7 Apr. 2015. Web. 03 Mar. 2017. "Peter Matia, 81, Succumbs Won Safety Prize as Miner." Rochester Democrat and Chronicle [Rochester, NY] 7 Nov. 1957: 29. Print. "Poles at Oakfield Fought at a Dance." The Daily News [Batavia, NY] 13 Jan. 1914: 7. Print. "Poles of Oakfield Held Mass Meeting." The Daily News [Batavia, NY] 18 Nov. 1918: 7. Print. "Priest's Rites Friday." Buffalo Courier-Express [Buffalo, NY] 26 June 1940: 13. Print. Radlinski, W. A., and Dean G. Rojek. A History of Holy Cross Roman Catholic Parish, Salamanca, New York. Athens, GA: U of Georgia, 1994. Print. "Rev August Parwulski." Olean Times Herald [Olean, NY] 32 June 1979: 10. Print. "Rev. Bernard I. Sierakowski." Buffalo Courier-Express [Buffalo, NY] 22 Apr. 1955: 28. Print. Warner, Darlene K. Gypsum Rock: This History of the United States Gypsum Company Oakfield Plant and Its People. N.p. : Oakfield Historical Society, 2016. Print. Warner, Darlene K. Our Glory Years 1885-1925 The Booming of Oakfield. N.p. : Oakfield Historical Society, 2013. Print. Warner, Darlene K. OUR LITTLE VILLAGE (The Rest of Our Glory Years). N.p. : Oakfield Historical Society, 2015. Print.